Hong Kong, 8th February 2019 – The Tai On chicken is famous for its delicate texture and full flavors, thanks to the slow-raising-no-nasties farming philosophy in their Hong Kong farms. 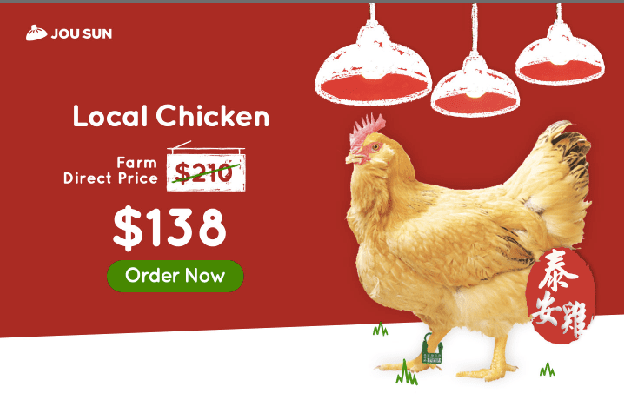 Before the launch of Jou Sun’s farm direct ordering service, buying fresh chicken involves going to a specialized stall in wet markets early in the morning, waiting for the butcher to slaughter the chicken, then taking the wet plastic bag home. Few urbanites can afford the time to shop for fresh ingredients to cook at home. “Time-starved families resort to takeouts or instant meals, which are not nourishing for our bodies nor social relationships,” said Jessica, co-founder of JouSun.com. The Hong Kong startup hopes to change how Hong Kong eats with its one-stop platform that allows customers to shop from local farms, importers and food makers. Due to Jou Sun’s commitment to radical transparency, the platform attracts high quality merchants that produces sustainable and healthy groceries. Taking Tai On for example, unlike western factory farms that churn out broiler chickens in 45 days with the aid of antibiotics, they insist on raising artisanal breeds that take twice the growing time, and thus double the cost. Using highly trained staff, modern hygienic standards and natural Chinese herbal supplements, Tai On keep their flock healthy without the chemicals. Starting February 11th, customers can order Tai On chickens at farm direct prices at 34% off. Both self-pickup or home delivery options are available. JouSun.com allows customers to buy quality groceries direct from local farmers, food producers and importers. With technology, we enable fresh produce to be harvested, butchered, or prepared on demand on delivery day so you can eat fresher while minimizing food waste in the food supply chain. We’re committed to making food more transparent, and we provide detailed information to help you make informed choices about the food you eat. Being the descendent of two highbred chickens, Tai On Chicken was first bred by Mr. Heung in Hong Kong in the 1950s. His achievements are well acknowledged by the industry. Located at the Tai Kong Po in NT, with a total area of over 200,000 square feet, their farm is equipped with state of the art fully automated farming facilities to produce the best qulity chickens. On February 11th, Tai On chickens will be available for pre-ordering at 34% off! Customers can choose home delivery or self pick-up from nine wet markets across Hong Kong. Ordering is quick and secure on JouSun.com, with pre-order available for up to 10 days in advance! Opting for delivery? FREE delivery is available for any orders above $300 — we recommend topping up your Tai On chicken order with organic vegetables from certified local farms harvested on delivery day! Temperature-regulated packaging ensures that the chicken stays fresh and safe during transport. Note that each customer can only order one Tai On chicken at this special price.